Pallbearer’s evolution over the last seven or so years has been one that seems natural and organic, with each record building on what came before and giving the Arkansas based band a step forward on the ladder towards greatness. Their demo of 2010 introduced a band indebted to doom greats Black Sabbath, but the inclusion of a cover of Billie Holiday’s “Gloomy Sunday” served to stand them apart from the crowd and on debut Sorrow and Extinction the band that we see now began to truly form. The Pallbearer of today is a band that proudly display their influences (the aforementioned Black Sabbath, the prog majesty of Pink Floyd, the spaced out vibrations of Hawkwind) yet they are so distinctly themselves at the same time – a hard trick to pull off but one that works effortlessly for this quartet. Heartless is not without heart; in fact it’s so full of emotion and longing that to listen to it is to take the journey into the unknown and leave only when completely broken down. “I Saw the End” begins the voyage on weighty bass lines that crunch through the guitars yet it’s Brett Campbell’s voice that soars above all – a voice that has grown alongside the music and now feels less affected and more natural. Time is a great teacher and in Campbell’s case that adage rings wholly true, particularly in album closer “A Plea for Understanding” which may be the most heartrending track in their catalogue. “Thorns” is a heavier prospect and the doomier elements make a claim for possession and are more reminiscent of previous material than anything else on the record. Guitars are layered with sadness and take flight over deeper moments to create a sense of hope that while hard to find, is something that we all strive for in the harsh passage of life. 2014s Foundations of Burden was a record that found solace in the outer reaches, but Heartless tries to find it in more grounded places. “Dancing in Madness” and its mournful synth-led introduction signals a monolithic change in pace and this track moves slowly towards its endpoint, taking its sweet time and building the ache in your heart to painful proportions. Guitars are bluesy and rich and with Joseph D.Rowland’s heavy use of electronics taking a prominent place, the song echoes with clarity and tangible anger in the heavier passages. It’s in “A Plea for Understanding,” the final track on the album, where Pallbearer shine the torch into the darkness and the emotional core is felt most keenly. The song begins on a funereal march with drums beating slowly and powerfully, while the guitars strike notes in deliberate patterns and the bass weighs over all with oppressive force. When the song falls back into lighter notations the vocals change to a far deeper register which is a curveball but one that feels altogether necessary and welcome. Campbell’s voice then ascends to the heavens and in the chorus the heart is utterly exposed. A love song at its centre, “A Plea for Understanding” delves deep into the complexities of giving yourself completely over to another person and in the supplication to a power far greater than one can ever really comprehend, Pallbearer grasp what it is to be human. The plaintive guitars give essence to the feelings lamented within and shatter the heart into a thousand tiny pieces – it may take a while to recover. 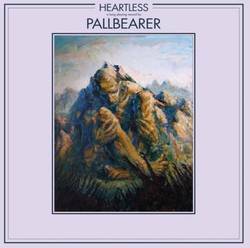 Heartless is surely the record that truly makes Pallbearer a great band and one that can make that leap over into the consciousness of the more mainstream side of rock music. With songwriting that breaks hearts and an attention to detail that is almost faultless, this record will surely be seen in years to come as a classic. Pallbearer are absolutely worthy of that and of the accolades that will be bestowed upon them for an album that elicits an enormous emotional response and transcends boundaries. Posted March 27, 2017, 8:50 p.m.
Posted April 28, 2015, 3:27 p.m.
Posted July 26, 2014, 10:59 a.m.
Posted July 10, 2014, 7:52 a.m.